Kotoyo Noguchi is an independent manga artist, illustrator and designer based in Japan. To date she has published two volumes of her Life with Mii: Everyday Cat Stories (Shirokuro Neko Manga) series in English for an international audience through the Kindle store. The manga depicts true stories from the author’s personal experiences taking care of a pet cat, and its heartwarming style has made it successful enough to top Amazon Japan’s list of bestselling Kindle comics. Anime UK News recently had the opportunity to ask the creator a few questions about her manga and the unique challenges of self-publishing for a global audience. 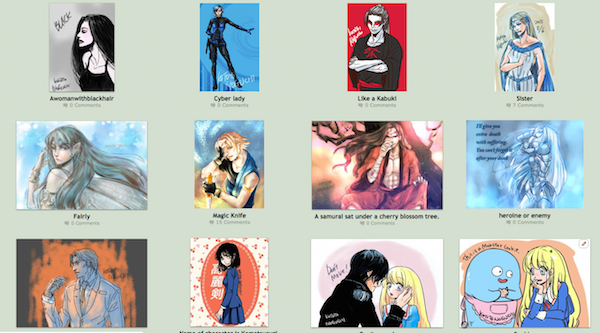 AUKN: When did you first start creating illustrations and manga? When I was about fifteen years old I started drawing manga in my notepad with a pencil. Back then, I also wrote novels. 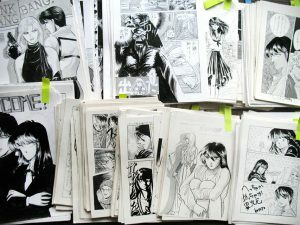 At age seventeen I joined my high school’s Manga Club and began drawing manga using a pen and ink. It had to be in English in order to be read by people around the world. 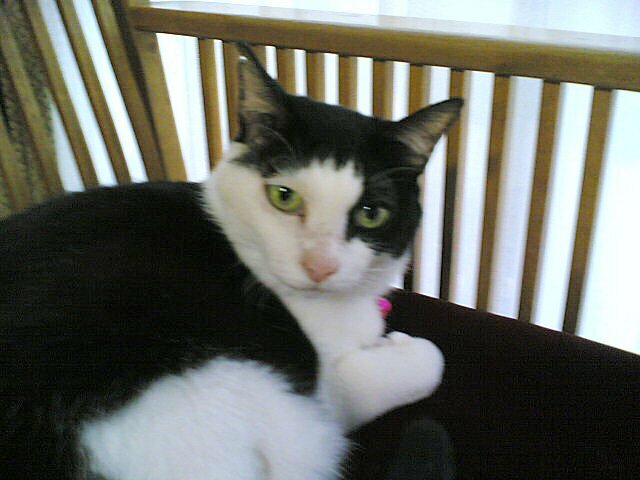 Japanese-language editions weren’t accepted back when the KDP (Kindle Direct Publishing) service launched on Amazon USA, so I’d planned to publish in English right from the start. There are different fees depending on the platform. The payment methods, commission (such as delivery charges) and taxes vary from country to country. Manga in particular uses a lot of data, which means that the selling price can’t be too low when authors have to pay delivery charges. The creators don’t receive any manuscript payment or advances and have to bear all of the risks themselves. I wouldn’t recommend it to other authors, but I think that those who want to give it a try will still go ahead. Of course, I’m very glad to see Amazon reviews from readers. Reviews are ideal for making recommendations to other readers, while social networking suits direct communication with authors. Any reviews or comments give the creators a lot of motivation (and occasionally, they knock the wind out of our sails too). Because authors create their books in order to make readers happy. I think that receiving both reviews and direct correspondence is a wonderful thing. Of course. Life with Mii has a sequel in Japan due to reader demand. I’d like to publish an English version of it someday. Japanese-speakers don’t have access to much information about services and events in the English-speaking world. So I think Japanese creators have to communicate with English-speakers in a positive manner. It’s easy to participate in online activities (like this interview) so I was keen to do it. But some publishers dislike allowing direct contact with authors. Also, many Japanese people are not good at English, which I think is the biggest issue. I didn’t expect to be interviewed by Anime UK News. 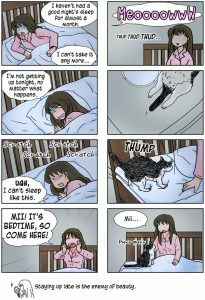 AUKN: Your Life With Mii manga collects lots of different short stories about your experiences taking care of your cat. Are any of the stories about Mii-chan particularly close to your heart? 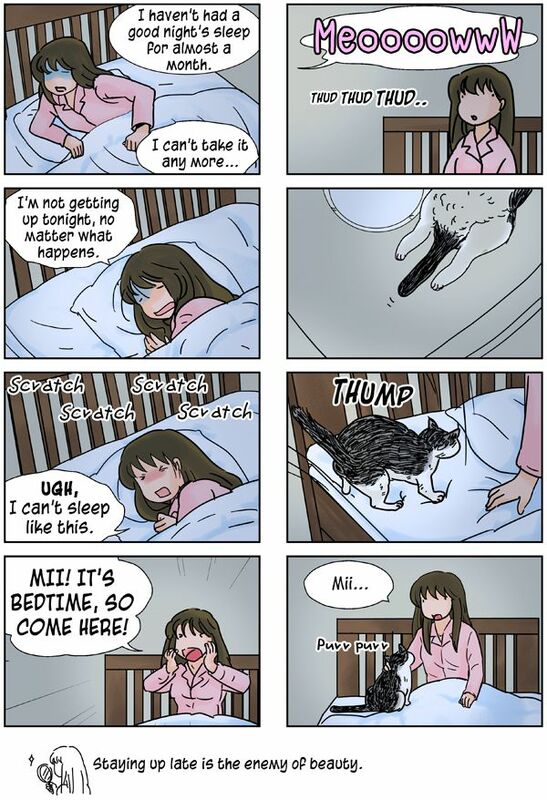 While I like every memory with Mii, the first time she got in my bed is unforgettable. 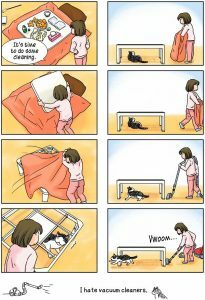 AUKN: Your drawings of cats are very cute, and cat lovers will instantly recognise the way their pets behave in your work even though our countries are so far apart. Even though your manga can be enjoyed by people all over the world, there are lots of small details in the background which are distinctly Japanese, such as the stories about using a kotatsu in winter. When your manga was being adapted into English, were you worried that foreign fans might not understand any of the cultural references? I asked my friend, who is a translator, some questions before publishing. She told me “Never mind, leave it as it is.” After publishing, I received a message from a reader in Mexico. 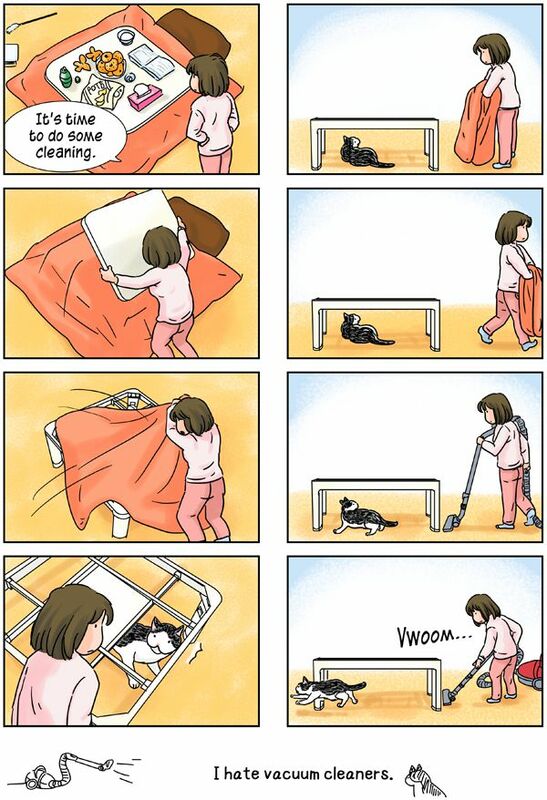 She said “I want to buy a Kotatsu. I have become very interested in it.” I wonder whether cat lovers want to buy silver vine too? Things we’ve never seen before can be attractive. As a matter of fact, I wanted to eat Marmite when I saw it on the Internet but I couldn’t buy it in my local grocery shop so I bought Vegemite instead. Well, I think it had an interesting taste. AUKN: I see that your two books have also had physical releases in English through Amazon’s CreateSpace service. Do you feel that there is still a demand for paper copies of manga, rather than reading everything electronically? I think it’s important that readers can choose the format they prefer rather than it being my opinion. Both digital and physical publication have strengths and weaknesses. It’s good to have two options available so there’s a backup, and likewise it’s good to have many distribution channels, including book shops. However, the costs increase along with the number of middlemen. It’s a difficult route for a self-publisher. Furthermore, book shops might sell more than physical books in the future. 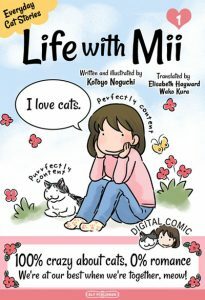 AUKN: The translated version of Life With Mii has also been released on the Japanese Kindle store as a language-learning aid for Japanese readers studying English. The concept of ‘tadoku’ – learning another language naturally through reading rather than traditional study – is really interesting and attractive. Have you considered adapting your manga for English-speakers who are learning Japanese as well? Of course I’ve thought about it. Learning a foreign language takes a long time; if you’re not happy then you can’t keep going. Language is a communication tool but in Japan its main purpose is for taking tests. Since learning methods have been focusing on grammar for many years, most Japanese people can’t actually use English. For more about the effectiveness of Tadoku, please read the story of the linguist Stephen Krashen. AUKN: The designs on the Life With Mii merchandise are very cute (we love the “You are the boss” picture!) What made you decide to start selling merchandise based on your manga? Thank you! I love it too. I originally created it as a LINE sticker. It’s good but I wanted to have some merchandise like T-shirts, so I thought “I’ll make what I want!” Cat lovers want to be with their favourite cat at all times, right? 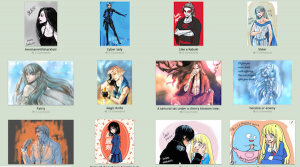 AUKN: Your DeviantArt/Instagram accounts (and the larger illustrations of Mii in the Life With Mii manga) show that you can work with a variety of art styles. Have you considered trying a more realistic style in any of your future manga? We would be interested to see it! Yes, I will make works in a variety of styles. I have to do the design and editing, so I have several authors within me and I feel that I have to nurture them. Going back to the question, I’m currently editing some manga I drew back in my school days which is very interesting. It’s so crude that it takes my breath away, but that’s fine. Such things can’t be published commercially so that’s one of the advantages of self-publishing. I even made an animation a few years ago (the translation is still underway so it’s only in Japanese). AUKN: You are quite active on social media (Twitter, Facebook, Instagram etc). Do you find this is a good way to promote your work across the world? It’s good to use the best method. Each social network has its own features so I think we have to choose the service according to the situation. For example, official information goes on Facebook, rough pictures go on Twitter, and so on. I can’t list all of the ones I like! Ah, well on the topic of gender there’s Princess Knight and Lady Oscar (The Rose of Versailles), for special powers there’s Tokimeki Tonight and Fullmetal Alchemist, for science fiction there’s Dirty Pair and Galaxy Express 999, for action with a female cast there’s Yajikita Gakuen Douchuuki, for fantasy there’s The Twelve Kingdoms, Guin Saga, Moribito; I like these kinds of things and they inspire me. With Life with Mii, I wanted to express it as a picture book like Hans Fischer’s Pitschi and Charles Monroe Schulz’s Peanuts. Hi, Anime UK News readers, I’m Kotoyo Noguchi. Life with Mii is a manga of my life with my cat Mii. Unfortunately, Mii now lives on in Heaven. 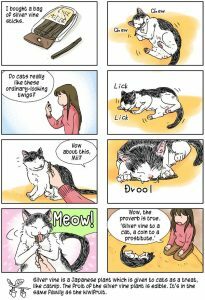 When sharing your life with a cat there are happy things and also worries about foods, training and whether your cat might be sick. Life with Mii is for people who have cats and people who have lost their cats; I drew it for all of the people who love cats. Although I can’t talk to each and every one of you, I hope this manga will snuggle up in your life. All images used in this interview are copyrighted and the property of Kotoyo Noguchi. They have been reproduced with the creator’s permission. 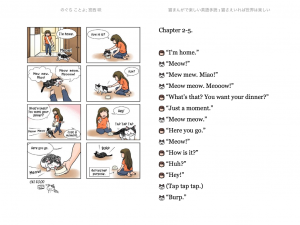 If you enjoyed this article, please also check our interview with Mariko Hihara, a Japanese author involved in self-publishing for the English-speaking audience.